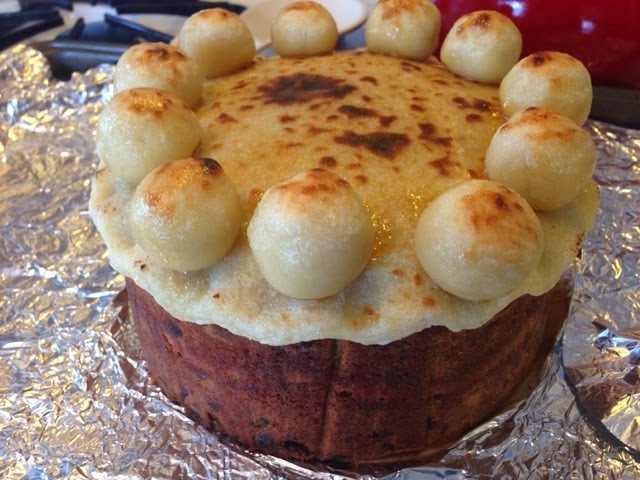 [Americans in particular] may ask, "What's a Simnel Cake?" I did. As did anyone who asked me what I was making for Easter, after I told them what was for dessert. I love holidays. I love the traditions associated with them, the traditions that shape our memories. They weave scraps of years together into a single memory, which we may call "Easter", or "Fourth of July", or "New Years Eve". The events on that day of any particular year may fade away, but the traditions endure, giving us a sense of security and meaning as that day comes again. 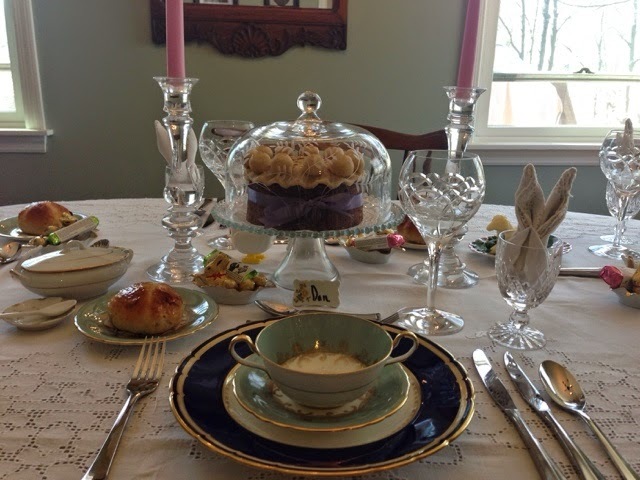 We hosted a family holiday dinner for the first time this Easter, and I wanted to mark the event with a new tradition of our own. 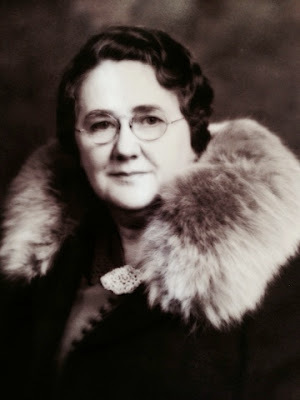 My maternal grandmother was half English. 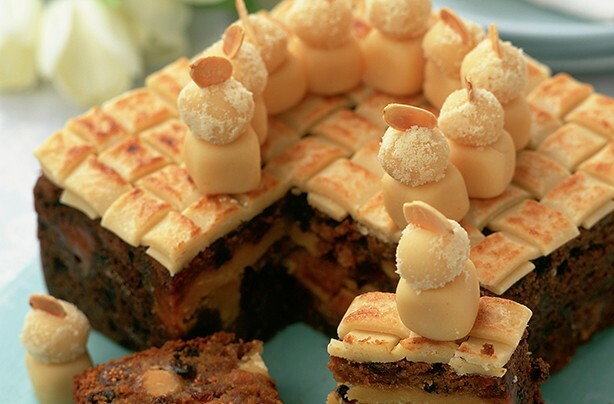 As a result, most of our standby Easter dishes are traditional English ones (the lamb, the mint sauce, the hot cross buns), so I wanted to serve a dessert that would fit with the rest of the menu. 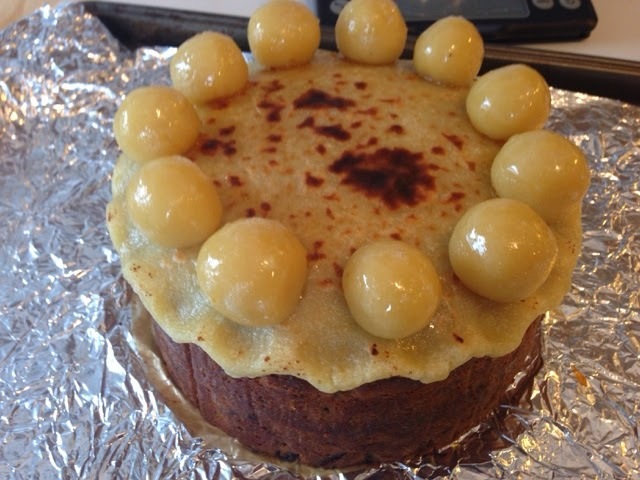 Lo, the Simnel Cake. 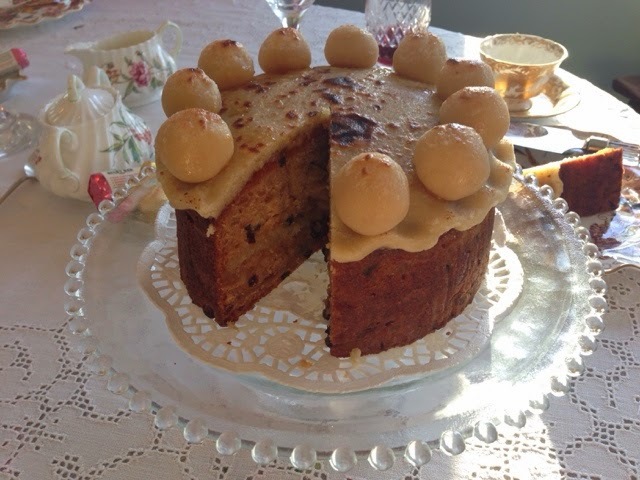 A traditional English fruit cake with a playful, endearing topping of eleven almond paste balls, and a colorful history that is up for grabs. I made ours for Easter, but I think it would make a really charming Mother's Day gift as well. 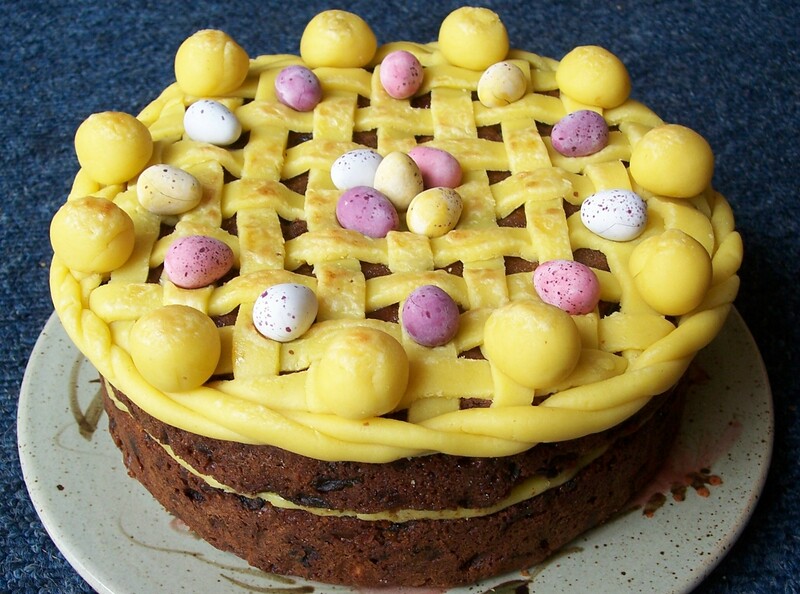 There are loads of Simnel Cake recipes out there, but I wanted to create one with my own twist. 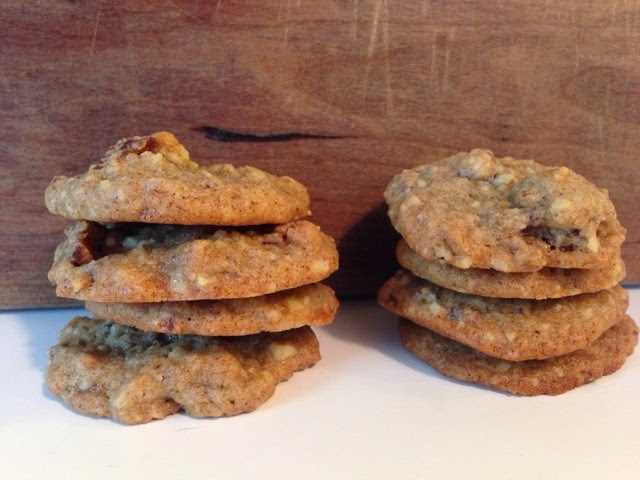 Using traditional proportions of equal parts butter, flour, and sugar, with twice as much dried fruit, this recipe offers an apricot and ginger flavor profile, using three kinds of ginger (candied, fresh, and ground) and two kinds of apricot (dried and preserves). 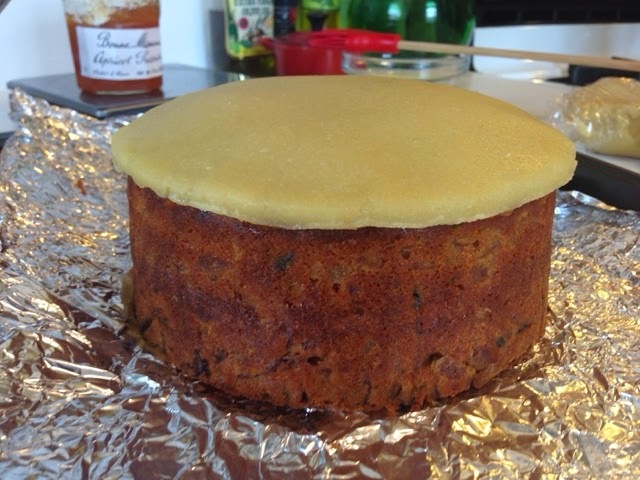 This cake can be made over a period of three days, if you want to space things out. I have broken the steps for this recipe down into 1) Preparation, 2) Baking, and 3) Decorating. Step 1: Preparation is everything. 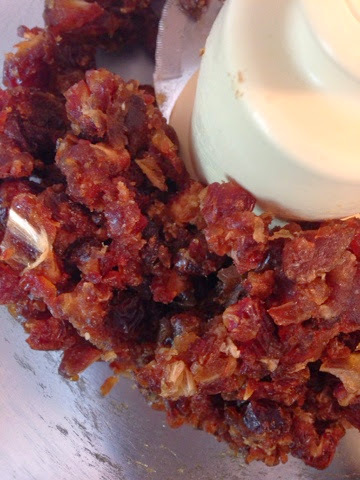 Chop apricot, orange peel, and candied ginger to raisin-size pieces. Place apricot, currants, golden raisin, candied ginger, and candied orange peel all into a bowl. Add bourbon, orange juice, and enough warm water to fully cover the fruit. 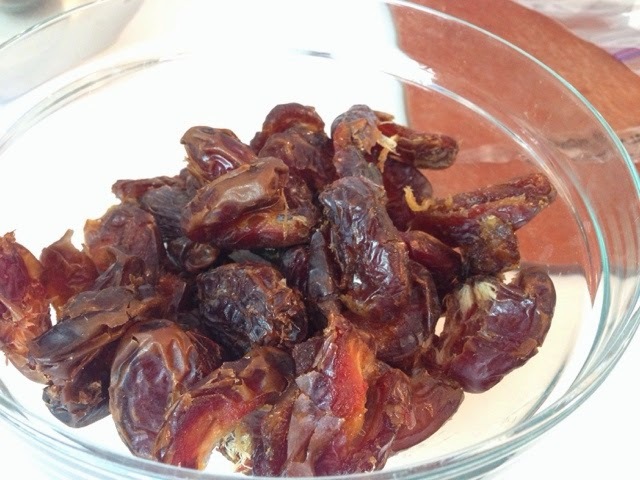 Soak overnight (or, if not soaking overnight, microwave for 5 minutes and let sit for 15 minutes). 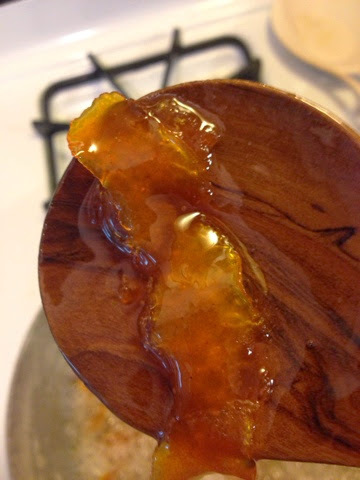 Note on the candied fruits - I used Jacques Pepin's candied orange peel technique, to make the candied peel because it's quick, it's not fussy, and who doesn't love listening to Jacques Pepin cook? I considered candying my own ginger, but honestly, the Ginger People make great products that basically eliminate the need for this step. I used their Organic Crystalized Ginger. 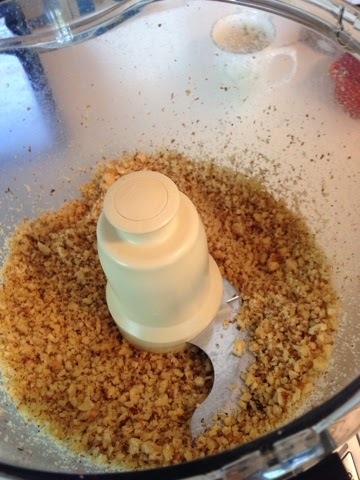 Make almond paste: Process almonds in food processor until very finely ground. Add caster sugar and pulse until mixed. 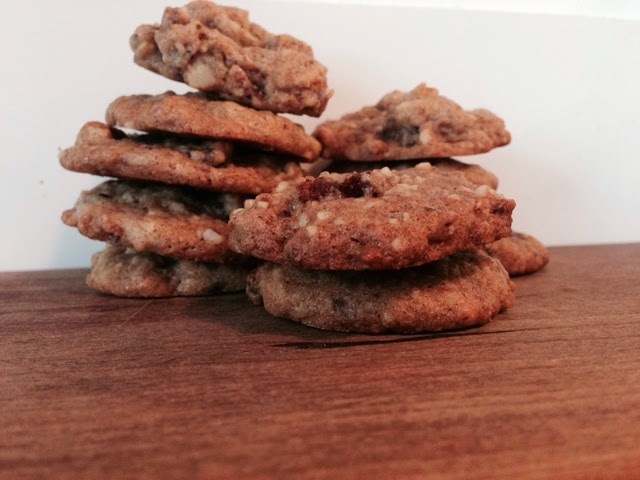 Use spatula to ensure ingredients are evenly incorporated. Add ginger and almond essence, pulse. Add eggs, a little at a time. Run processor between each addition. 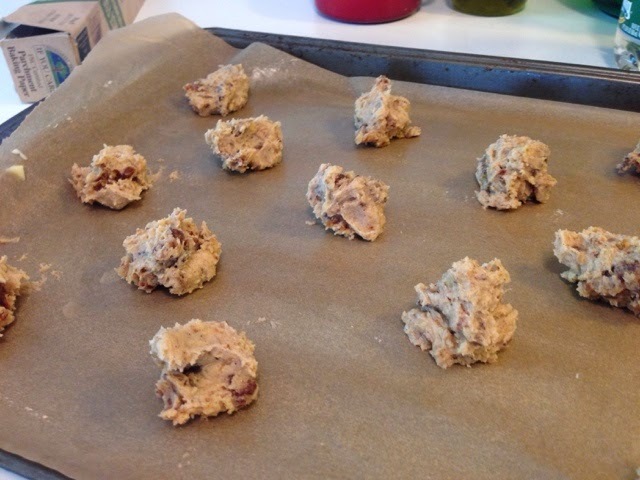 Stop adding eggs when mixture comes together, pulls away from sides of food processor, and has formed a pliable dough. You will likely not use the entire quantity of eggs. 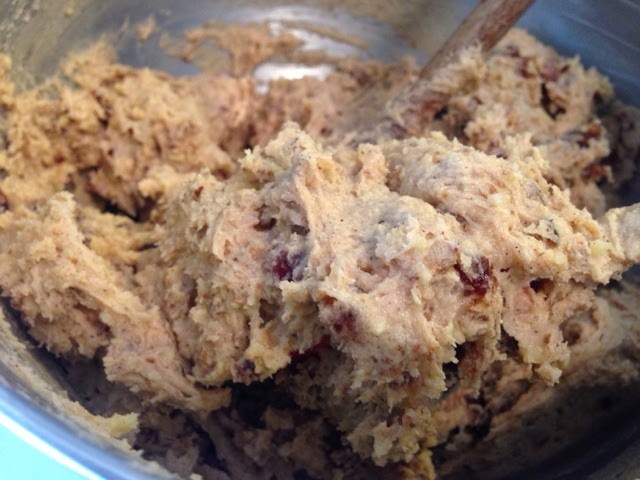 Knead almond paste until consistency is smooth and moldable. 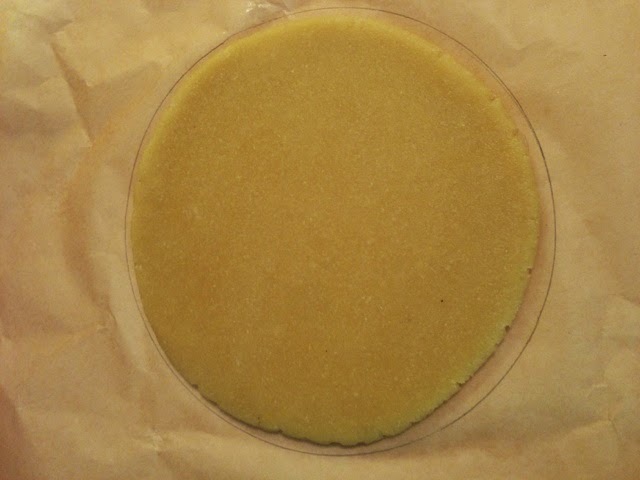 Separate into thirds, shaping two of the sections into round disks, and wrap each tightly in cling wrap so it doesn't dry out. Refrigerate. Step 2: Bake the cake. Take a round disk of almond paste out of refrigerator to bring to room temperature. Line a colander with a paper towel, and place soaked fruits in colander to drain. 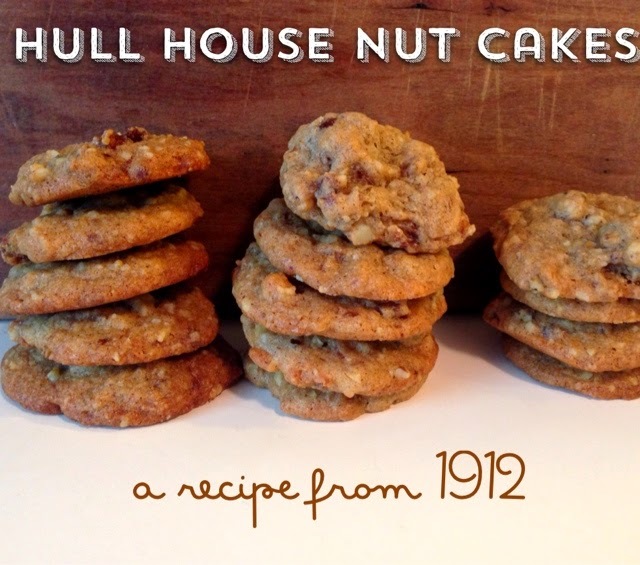 In a bowl, whisk together sifted flour, baking powder, spices, and salt. Set aside. 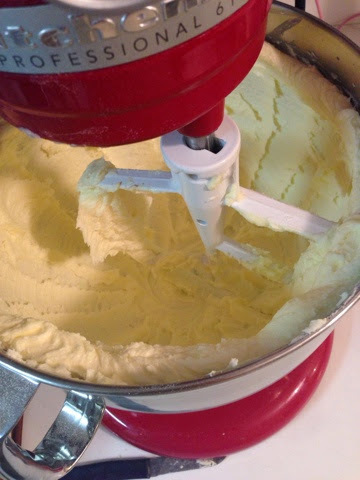 In a large mixing bowl, cream butter and sugar until fluffy and light in color. Beat in molasses. 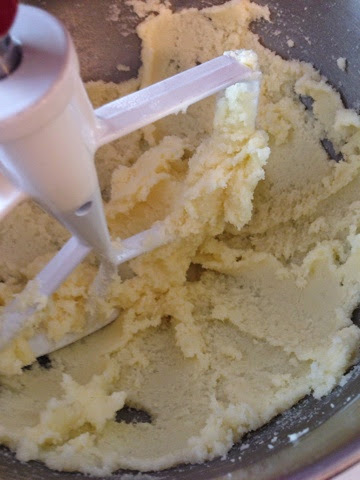 Add one egg at a time to creamed butter and sugar, and beat in until smooth. Pat soaked fruit with tea towel or paper towel to squeeze out a little more moisture. 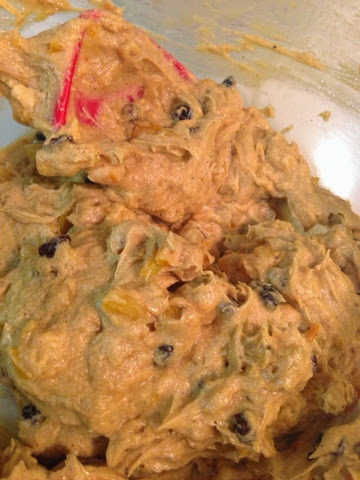 Add fruit and minced ginger to batter, and gently fold together. Set aside. 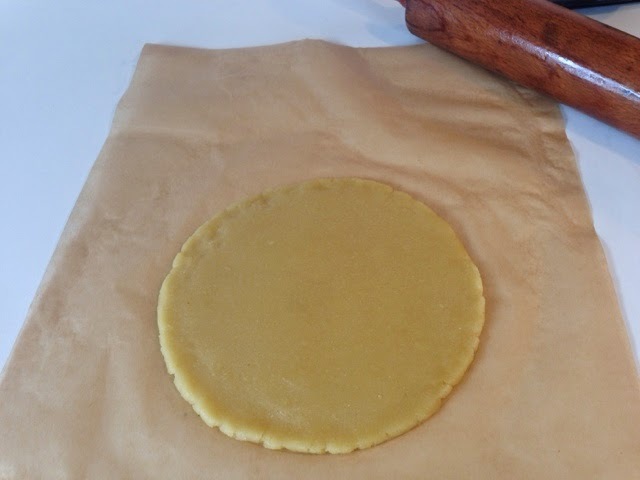 To roll out the almond paste filling: Tear a square of parchment paper off the roll. 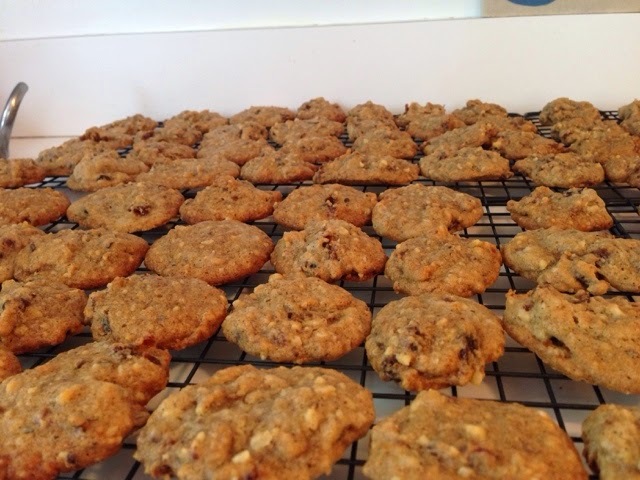 Place the cylindrical part of your baking pan on the parchment paper and trace around it with a pencil. Flip the paper over, so the pencil mark doesn't transfer onto the almond paste. 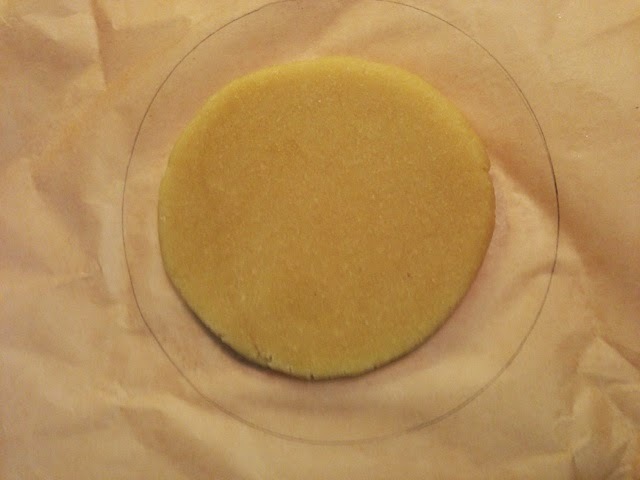 Take one third of the almond paste shaped into a round disk, and center it in the circle you traced. 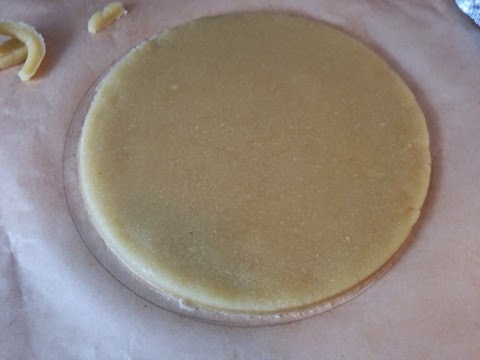 Roll it out to be just a bit smaller than the circle you traced, rotating the parchment as necessary and occasionally flipping the paste over to keep it smooth on both sides. 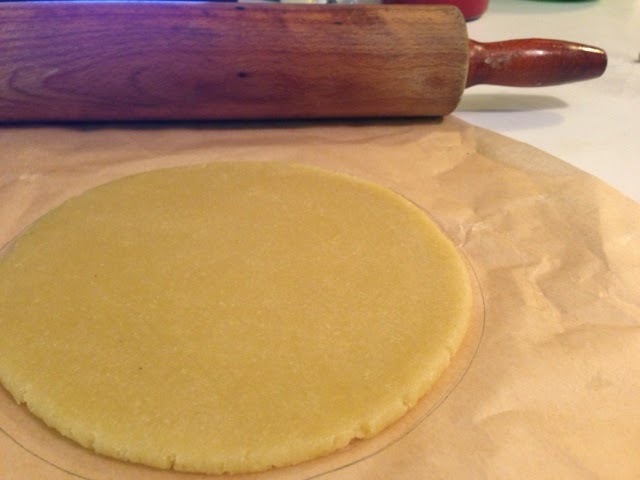 Roll gently and evenly so the edges of your almond paste don't crack too much. 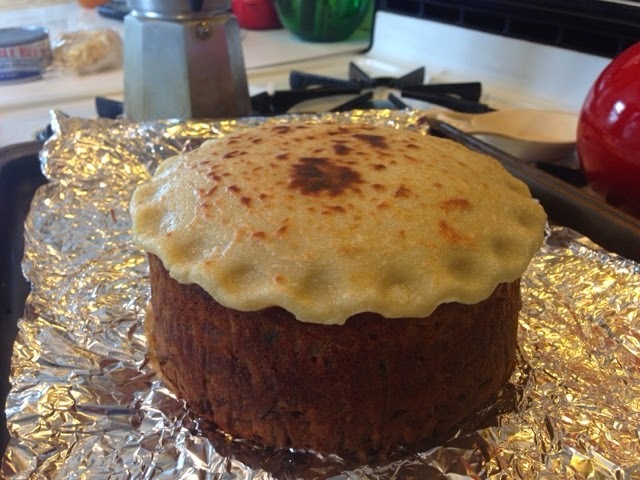 (While appearances don't matter as much for the filling, this is good practice for the cake topping.) 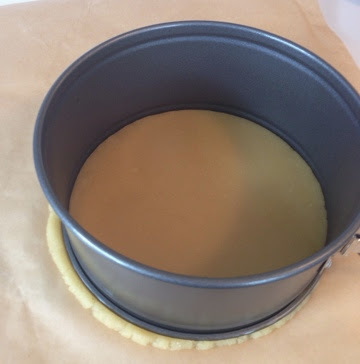 You can set the cylindrical part of the cake pan down over the almond paste to make sure it is the right size. 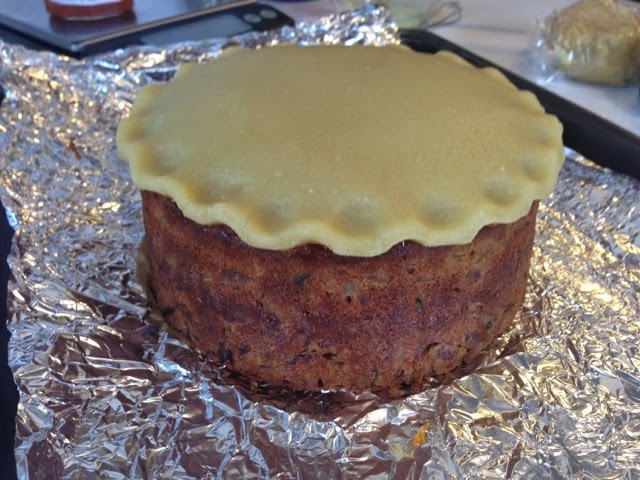 Lay cling film over the top of the almond paste so it doesn't dry out. The ginger in the almond paste smells absolutely lovely as you roll it out. You want to roll it out just a little smaller than the circle you traced.. This allows the cake batter to rise around the edges as it bakes, ensuring a uniform crust around the sides. 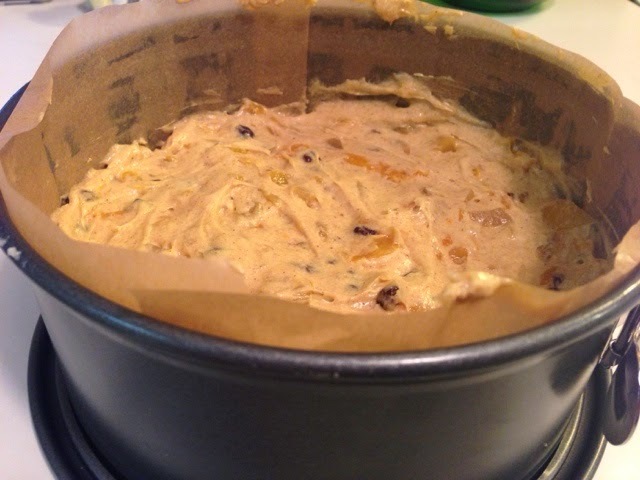 Tip half of the batter into cake pan. Smooth flat. 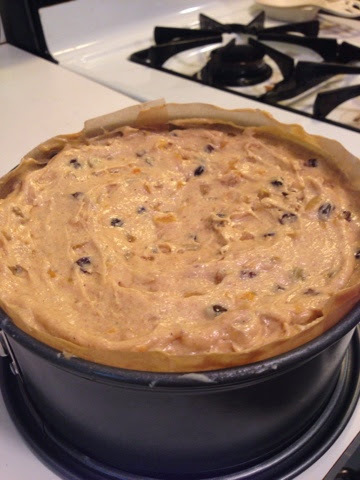 Gently lay your round of almond paste into cake pan on top of batter. Press gently to smooth it out. 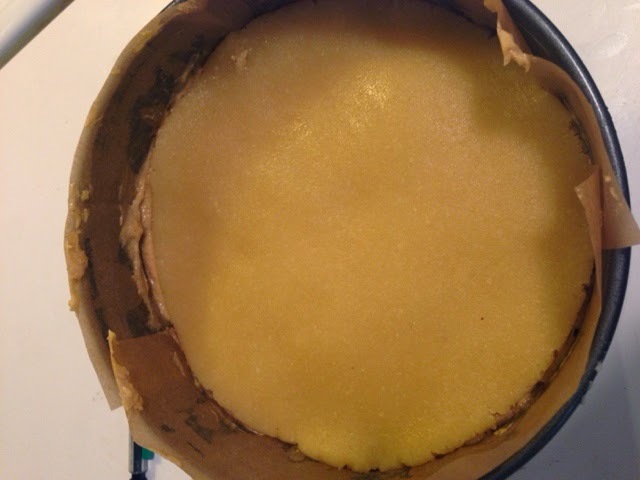 Ensure almond paste is centered over batter so batter can rise around edges of almond paste while cake bakes. Tip or spoon remaining half of batter into cake pan. 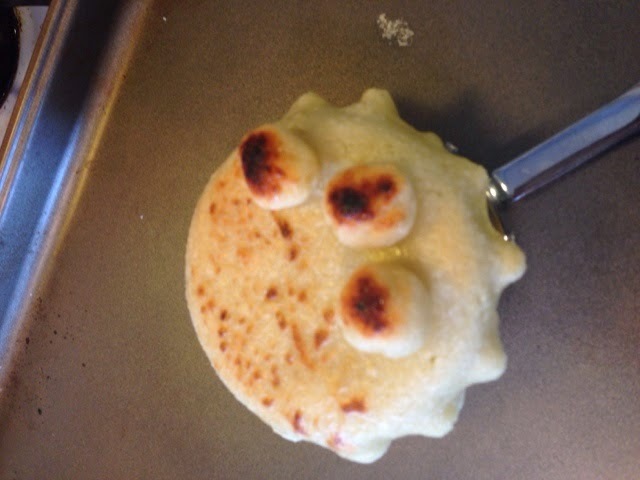 Spread it with a spatula to make it even with a slight dip in the center (this is so it rises evenly). Bake at 300 degrees for 2 to 2.5 hours. Watch to see if top is getting dark. If so, loosely cover with tin foil. check cake for done-ness with a skewer every 10 minutes after 2 hours until cake is done. Remember, almond paste center will leave some residue on skewer, but no batter should stick. 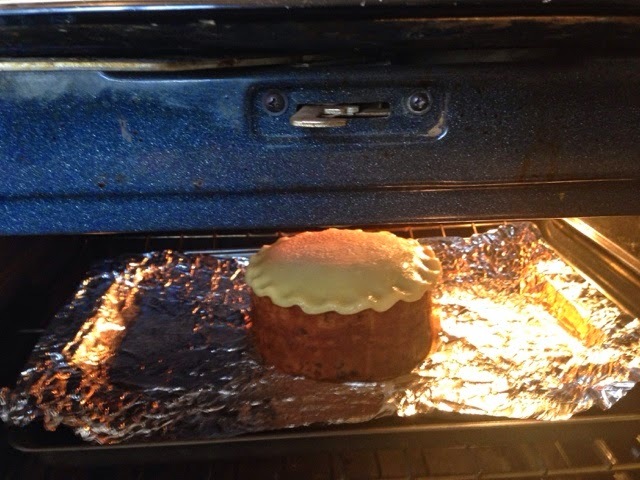 Remove cake from oven and let cool on wire rack for 15 minutes. 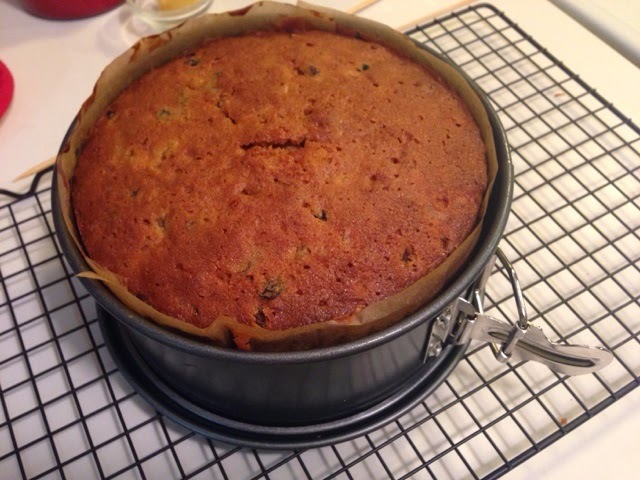 Remove cake pan and let cool until no longer warm. 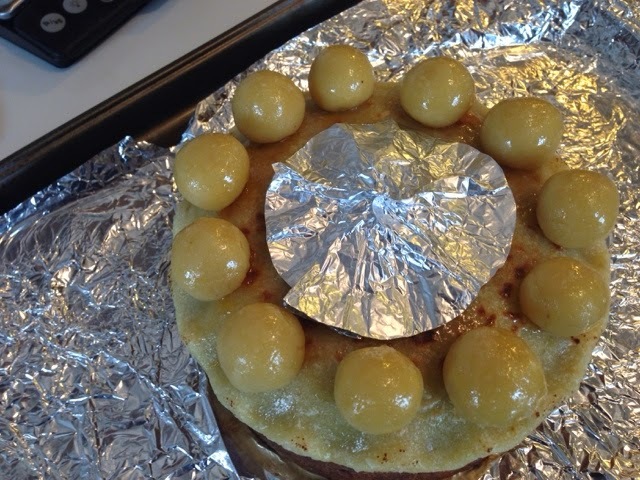 Wrap cake tightly with tin foil until you are ready to decorate. 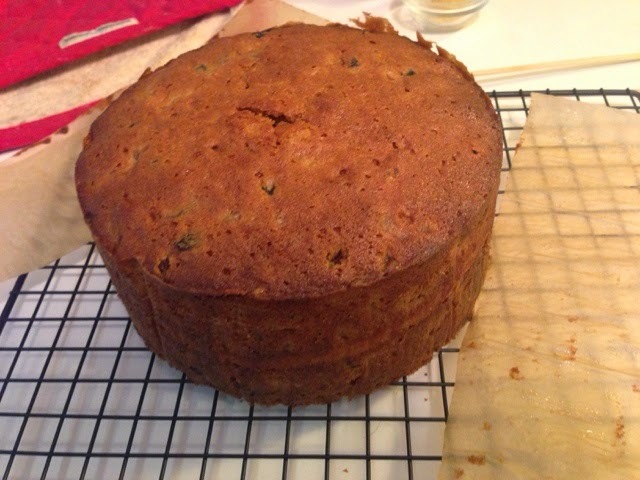 Cake can sit for up to a week; the bourbon in the fruit will mellow with time. Bring the remaining almond paste to room temperature by taking it out of the fridge about an hour before you need to use it. 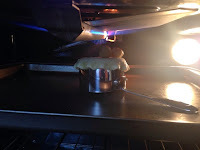 Place the cake on a baking sheet, so you will be able to move it from counter to broiler easily. Warm up some apricot jam so it can spread easily with a spoon. (I use Bonne Maman preserves for anything like this. 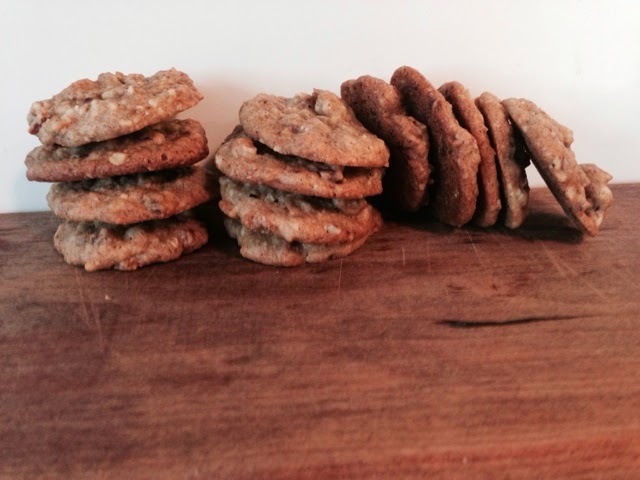 It's readily available in most grocery stores, as well as reliably flavorful and fantastic. It kindof makes me want to make eating toast and jam my full time job.) Generously spread your jam across the cake. You want the apricot to be a standout flavor, so don't be shy. 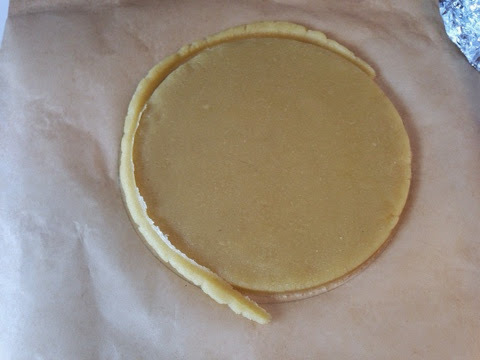 Roll out the second disk of almond paste using the same method as above, but in this case, roll it all the way to the edges of the traced circle. My rolling pin is glowing with almond oil. I'm pretty sure making this was like a spa treatment for my usually floury rolling pin. 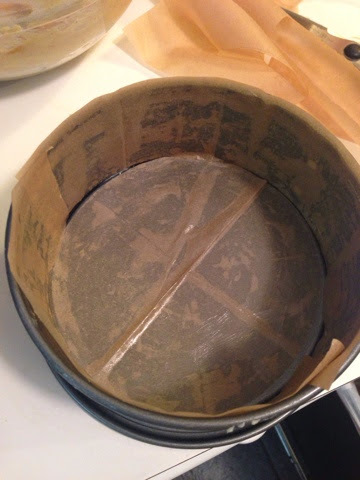 Now, use the cylindrical part of the cake pan to neatly trim the edges. Center the cake pan over the almond paste round, and firmly press down. This makes the perfect size and shape topping. 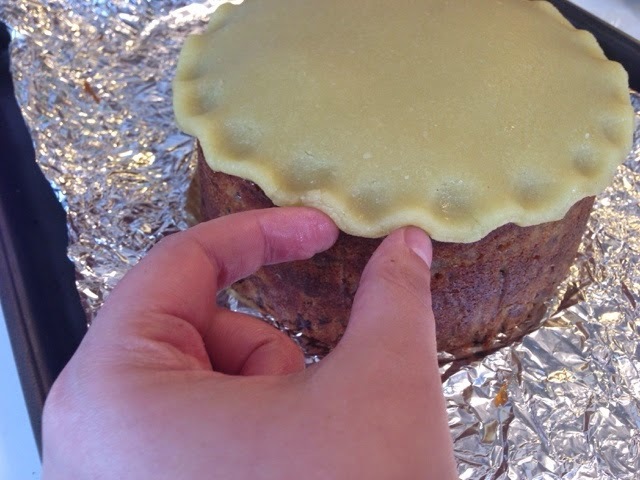 Gently lay the almond paste round over the cake, lightly pressing to smooth out any bumps. Soften any ragged edges on the almond paste by pinching or tucking them underneath. Flute the edges of the almond paste. 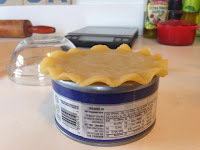 It is not stretchy like pie crust, so you will want to do this gently. I used the thumb and forefinger of my left hand under the edge, while pressing down with my right forefinger on the top. Repeat this all the way around the cake to achieve a nice, even ruffle. Beat your egg white until it's a little frothy. Use a pastry brush to glaze the top of the cake with the egg white. 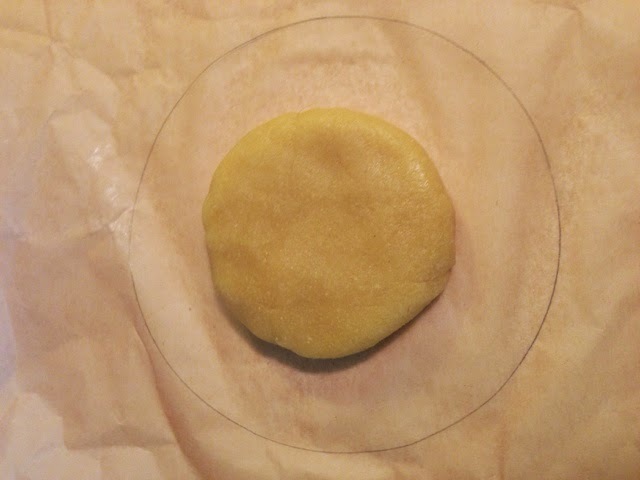 You are going to toast the almond paste decoration in two stages; otherwise the almond paste balls will get too dark, because they are closer to the broiler. Turn on your broiler, and let it warm up. 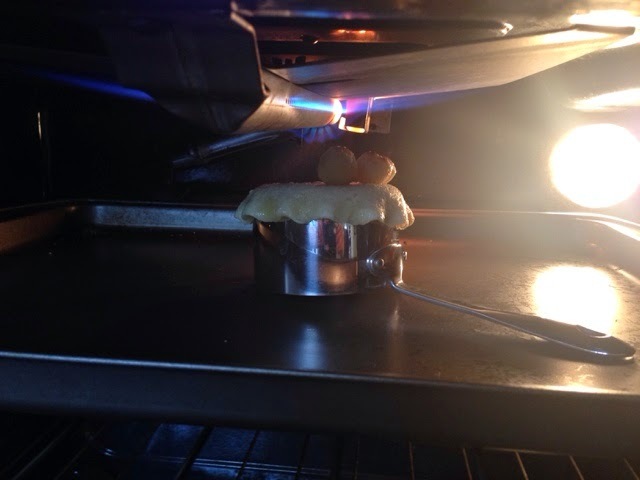 Put the cake under the broiler. Use an oven mitt to rotate the cake under the flame as it browns, so the top is evenly, lightly, toasted. Alternatively, use a chef's torch. 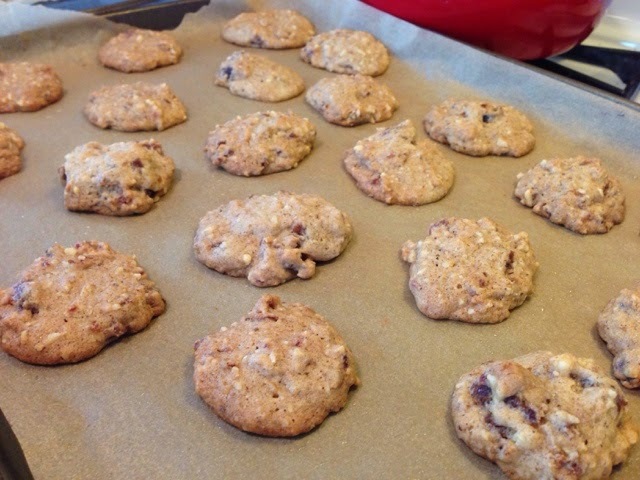 Take the remaining third of almond paste, and make 11 equally sized balls with it. I recommend rolling one to the size you like, weighing it, and using that weight to make the rest. 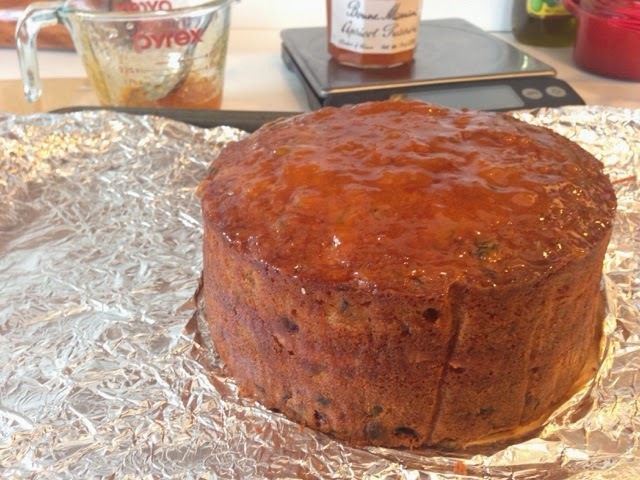 Put a dab of apricot jam on the bottom of each ball and stick them around the cake, equally spaced. Brush almond paste balls with egg white. I used a run-of-the-mill windproof lighter to burnish the ruffled edges a bit as well. 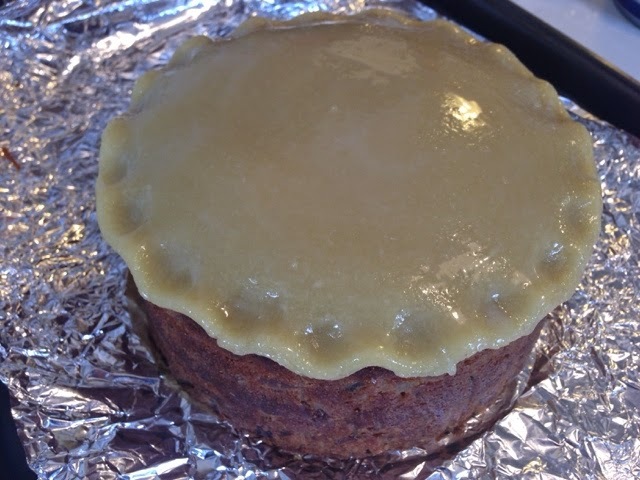 Make a little tin foil hat (see photo) to protect the already toasted part of your cake. 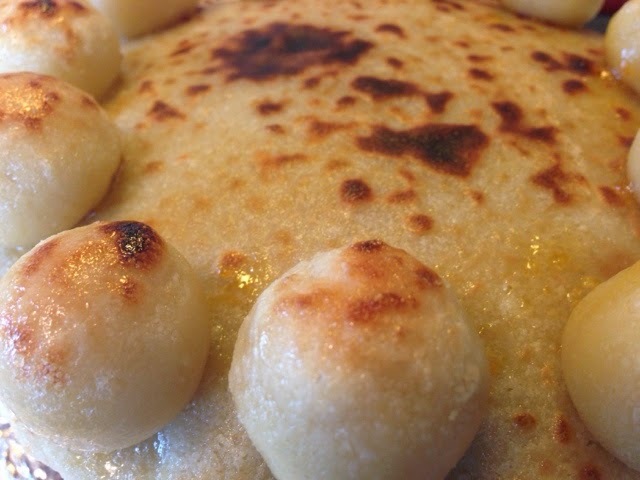 Put the cake under the broiler again, ensuring the almond paste balls are evenly toasted. 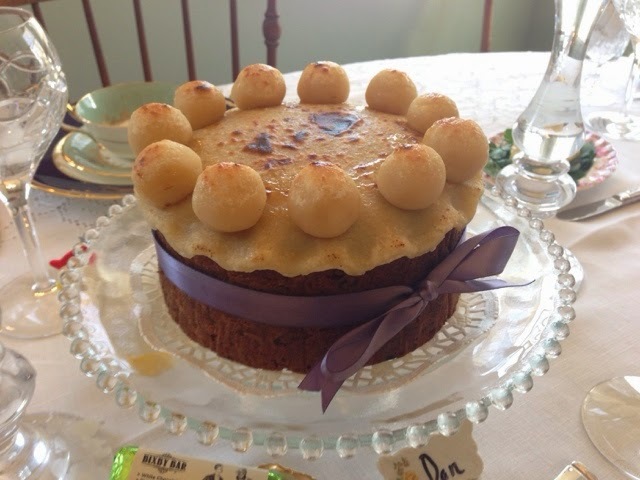 Simnel Cake gets a bad case of the fancies for Easter Dinner. 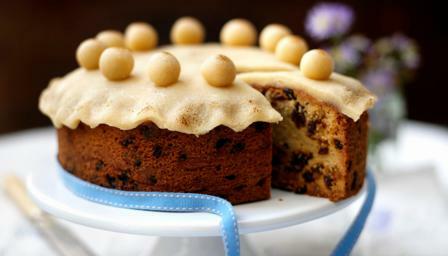 When researching this recipe, I came across some other gorgeous Simnel cakes. Check these out, and look on your own as well before you decide how to decorate yours. Note: I have never used almond paste in this way before, so I wanted to familiarize myself with the technique. I made extra almond paste, so I could practice working with the almond paste on a smaller scale before making the real cake. 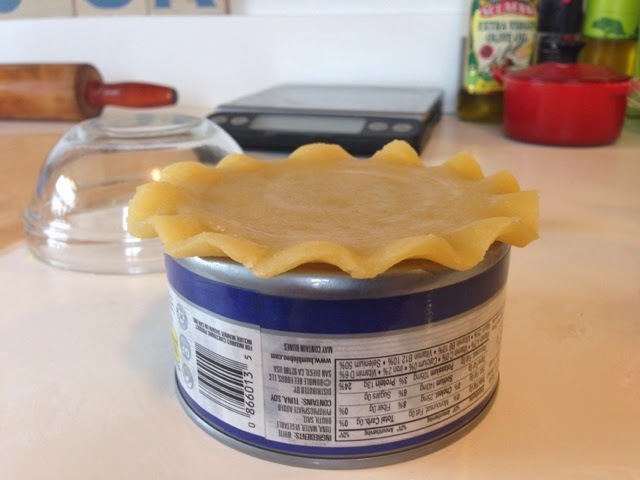 I used a tuna can to approximate a miniature cake, and a metal baking cup to practice toasting the almond paste under the broiler.